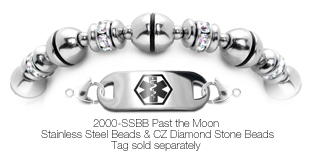 The fastest way to warn about kidney disease is to have a medical bracelet attached so EMT's know what to do. Include all other conditions to CKD along with critical meds so emergency responders treat the correct problem—especially if you're unconscious or unable to speak. Don't forget other medical issues such as heart problems, diabetes and critical meds. Doctors need a full picture to avoid drug interactions and to give proper aid. Do not let kidney disease stop you from living your life. 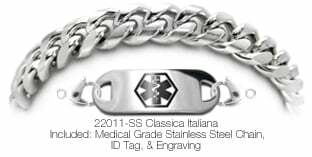 Be prepared with a well written medical ID bracelet. The AAKP is a specialized organization that has many resources to improve the quality of life for kidney patients. Join today—the Membership is Free! 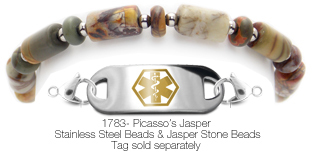 Buy medical bracelets through the AAKP Store and 10% goes to a great cause. 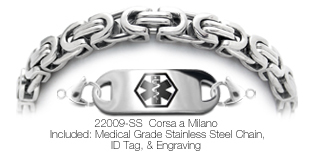 Many metals can tarnish: including gold, silver, platinum, rhodium, pewter and more due to kidney meds. That's why we recommend stainless steel for kidney and any other organ transplant patient. If you are unsure, it's better to be safe than sorry. Chemicals leeching through the skin in Kidney Patients can etch and pit most metals. This is often due to the anti-rejection meds and other medications that transplant patients usually receive. Not limited to transplants as some kidney patients may also be taking chemo meds for certain kidney problems. Acidic skin, caused naturally in some people, can also tarnish and etch pewter, precious metals and many more. We can guide kidney patients to alternative solutions that include beaded bracelets without metal parts which have colorful glass, ceramics and precious stones. We also have solutions in attractive stainless steel beading. Custom solutions are also available. A kidney is hard to get. Protecting it can be easy. 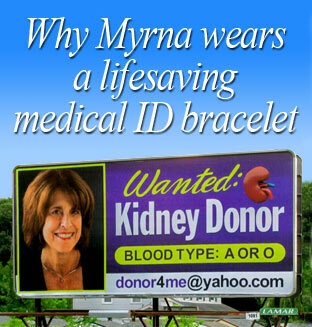 Myrna Bernstein put her kidney condition up for display: right next to Central Ave in Albany, New York. 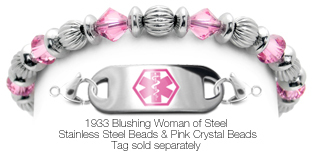 Her story will inspire you to pursue every possible avenue to get the treatment you need and protect yourself with a medical bracelet. Read more here. 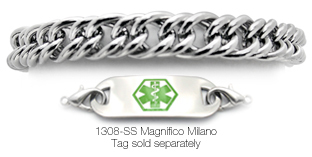 With over 600 styles to choose from, you no longer need to be embarrassed with an ugly kidney medical bracelet. Fluid retention. Without the kidneys to properly rid of waste in the blood, the toxins back up and cause swelling in the extremities. This could direct fluid into your lungs or the cardiac sac (pericardium) resulting in obstructions of the airways and blood flow to the heart which can be deadly if not treated promptly. Hyperkalemia. Put simply, hyperkalemia is having too much potassium in the bloodstream. This is more common in CKD patients than what is considered normal because of the problems with filtration of the blood. If this comes on suddenly, the spike in potassium can impair the heart’s ability to function. Kidney disease is a concern to paramedics and doctors. That's why when you're unconscious, they need to know about your specific conditions to give you the right treatment. After all, every second counts. Chronic kidney disease (CKD), or chronic kidney failure, is the end result of a gradual loss of kidney function usually having spanned several years or decades. Symptoms do not usually manifest until the later stages of the disease—often at the point where the kidneys are damaged beyond repair. • Diabetes (DM)- 44% of new CKD cases have diabetes listed as the primary cause. • High blood pressure (HTN)- Every one in five adults with HTN have or will have CKD. • Older adult- The chance of having CKD increase with age, and is most common among individuals aged 70 years or older. Treatment for CKD focuses on alleviating symptoms (e.g. diuretics for swelling), controlling conditions that compound kidney failure (e.g. ACE inhibitors for HTN), and/or hopefully replacing the damaged organ(s) through transplant or dialysis. The course of action taken is completely dependent on both what stage of progression CKD is in, as well as the desires of the individual. Unfortunately, there currently is no cure for CKD no matter what stage they are experiencing, and unless a transplant occurs it is likely that the disease will result in death especially if not properly monitored by a physician. Centers for Disease Control and Prevention (CDC). National Chronic Kidney Disease Fact Sheet: General Information and National Estimates on Chronic Kidney Disease in the United States, 2014. Atlanta, GA: US Department of Health and Human Services, Centers for Disease Control and Prevention; 2014.